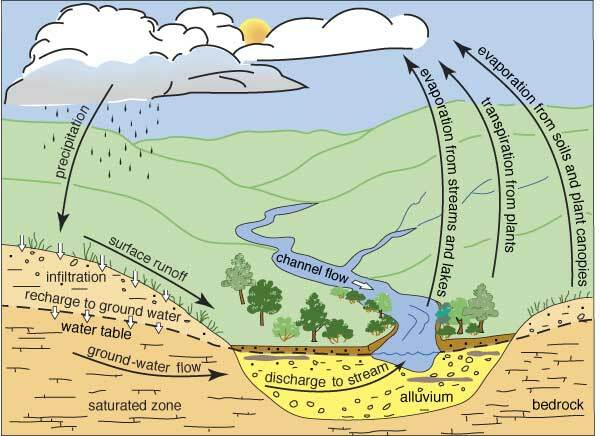 Ground Water and Aquifers: Many terms are used to describe the nature and extent of ground-water resources. The level below which all the pore spaces in the ground are filled with water is called thewater table (fig. 1). The entire region below the water table is called the saturated zone, and water in this saturated zone is called ground water. Unconfined aquifers are bound by the water table; that is, they have no confining rock layers over the top of them (fig. 2). A well sunk into an unconfined aquifer will encounter water when the well reaches the water table, which is the approximate level at which water will stand in the well. Some aquifers, however, lie beneath layers of impermeable materials. These are called confined aquifers, or sometimesartesian aquifers. A well in such an aquifer is called an artesian well. The water in these wells rises above the top of the aquifer because of confining pressure; the level to which it rises is called the static water level. If the water level rises above the ground surface, a flowing artesian well occurs. The quickest and easiest approach to finding information about water wells that have been drilled in the state is to access the records electronically on the KGS website (www.kgs.ku.edu) (fig. 3). Once there, click on the "WWC5" link under the "Water" heading (WWC5 refers to the name of the form submitted to the state by water-well drillers to record a well). This gives you a page that allows you to search by legal description or by county. To search by legal description, enter the section, township, and range in the appropriate boxes, then click "Select by T-R."
You will get a chart of all wells listed in that section. To see a record for an individual well, click on the location information for that well. The record for each well includes location, owner, depth, water level, well use, and completion date. Some wells have lithologic logs available, which describe the types of rock encountered at different levels of drilling. Scanned images of some WWC5 forms are available on the website, showing exactly what the driller recorded for that well; these images also can be printed or downloaded.